29 NIEUHOF, J. An embassy from the East-India Company of the United Provinces, to the Grand Tartar Cham, Emperor of China deliver'd by their excellencies, Peter de Goyer and Jacob de Keyzer, at his imperial city of Peking.. London : Printed by the Author at his house in White-Friers, 1673. Folio. 327, 18, 106pp. engraved frontis page, folding map of China and plan of Canton, 18 full page & 93 text page copper etchings, interior slightly browned and spotted. 395 x 265 mm. Je voudrais de plus amples renseignements sur le Lot N°5737 . ¤ FIRST ENGLISH TEXT EDITION of this most important and early resource on China and the Chinese. Three parts in one folio by John Macock for the author. Part I: An Embassy. Part II: A narrative of the success of an embassage sent by John Maatzuyker de Badem. 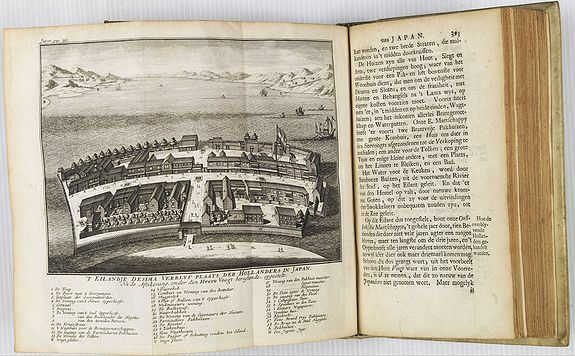 Part III: Appendix or […] out of Athasius Kircher his antiquities of China. This early account of China covers a wide variety of subjects including a large section on newly discovered plants, herbs, fruits of S. China. With a folding map of all China, Korea, part of Japan, Formosa, South to the Kingdom of Cannan [Annam or Vietnam], Tartary. The book contains a meticulous description of the people, laws, customs, provinces done in much detail. Lavishly illustrated with 121 text plates by W.Hollar. The work was one of the earliest English language texts which brought new and wondrous information back to England and Europe of a continent mostly unknown at that time. The plan of "Grounplot … of the Emperours Palace at Peking", with cut outer margin. The two folding maps backed on verso lower margin with old paper, for protective reason only. Plan of A good margin copy. - Wing N1152. Taylor 238. Morrison p.565. Cordier col. 2347. 30 SALMON, Tomas (& Matthias van GOCH). Hedendaegsche historie, of tegenwoordige staet van alle volkeren; in opzigte hunner landsgelegenheit, personen, klederen, gebouwen, zeden, wetten, gewoontens, godsdienst, regering, konsten en wetenschappen, koophandel, handwerken, landbouw, landziek Amsterdam, 1729. Uncoloured. 6 parts in one vol. 8vo. Contemporary blind tooled vellum, title in ink on spine. 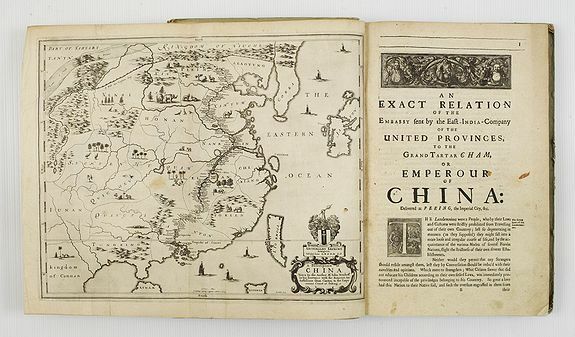 Engraved allegorical frontispiece by J.C. Philips (1729), 3 engraved folding maps of (1) China, including Japan and Kamchatka, (2) Japan 200 x 125 mm. Je voudrais de plus amples renseignements sur le Lot N°4228 . ¤ Original edition of the first volume of the Dutch translation of an extensive series on the geography, history and culture of most parts of the world, consisting of 44 volumes. This first volume deals extensively with China, Japan, the Philippines, the Moluccas and Celebes (the present Sulawesi) with its capital Makassar. This first vol. (as also vols. 2-9) is translated and much enlarged by Matthias van Goch (d. 1739), who added many original notes. Beginning with the part on Japan and the Moluccas in this volume, Van Goch enlarged and adopted the original text by Thomas Salmon to such extend that his text can be considered as Van Goch's own work. He could make use of the annotations by Gerrit Voogt which he wrote during his stay in Decima from 1706 till 1714. This part is illustrated with a beautiful view on the island Decima, the Dutch foot-hold in Japan, being copied from a manuscript by Vogue, who was second-in-command on Deshima in 1713. The island is viewed from the landside, depicting the developments of the new warehouses and the garden as well as the famous "speelhuis" which contained a billiard table and musical instruments on the upper floor. The original English edition was compiled by Thomas Salmon (1679-1767): Modern history, or The present state of all nations, the first volume of which (here translated) appeared in London in 1725. Thomas Salmon was an historical and geographical writer. He travelled extensively and resided in the Indies for many years. The original English series consists of three volumes. The entire Dutch series, based on Salmon's work translation, of which volumes 1-9 were translated/ written/ adapted by Matthias van Goch, was published in 44 volumes, between 1729 and 1803, published by Isaak Tirion and others. An Italian translation appeared in 23 volumes (1738-61). The work was also partly translated into German from 1748 onwards. Our copy preserves the unpaginated separate titles for the parts on Japan (nr. III and IV), Philippines (Nr. 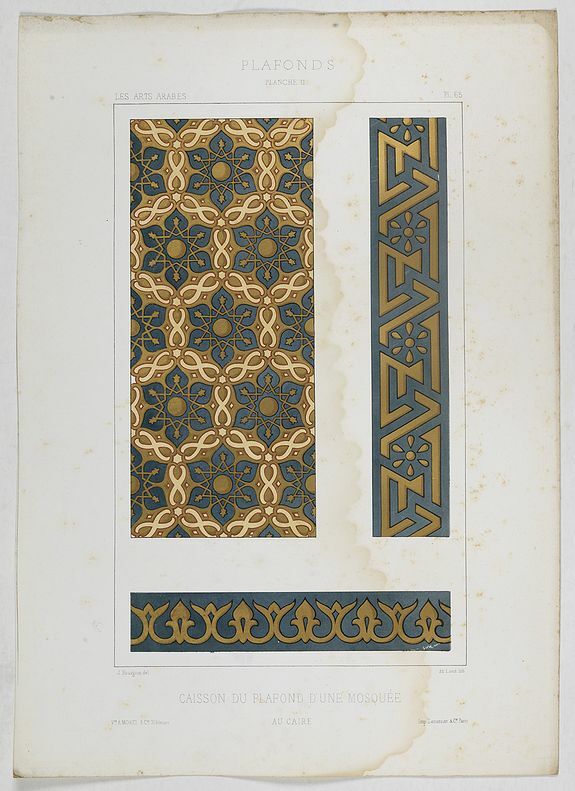 V and a leaf with the contents), and the Moloccas (Nr. VI, with 3 unpaginated lvs. with a preface). Very good condition. 31 PRISSE D'AVENNES, Achille Constant. L'Art arabe d'après les monuments du Kaire depuis le VIIe siècle jusqu'à la fin du XVIIIe. Paris, Morel, 1877. In-folio en feuilles de 199 planches (sur 200) et un vol. de texte in-4, 1/2 chagrin rouge (reliure de l'époque). Faux-titres, titres, table des planches, 199 planches pour la plupart lithographiées en couleurs ou teintées, certaines gravées. Rousseurs affectant le texte et de nombreuses planches, mouillures affectant quelques planches et les titres et tables du troisième volume. Quelques chemises de livraison subsistent. Mention de "deuxième édition" sur les chemises. - Text vol. in 4to (325 x 245mm) in half red Shagreen and 199 (of 200) plates in tall folio (573 x 402mm.). Text: (ii) + (viii) + 296 pp with 34 engraved plates. Plates are lithographed or engraved, approximately 130 printed in colours. Spotting troughout text and plates, water staining affecting a few plates, titles and tables of third volume. Some original publisher’s wrappers remain with the mention of second edition. 573 x 402 mm. Je voudrais de plus amples renseignements sur le Lot N°64992 . 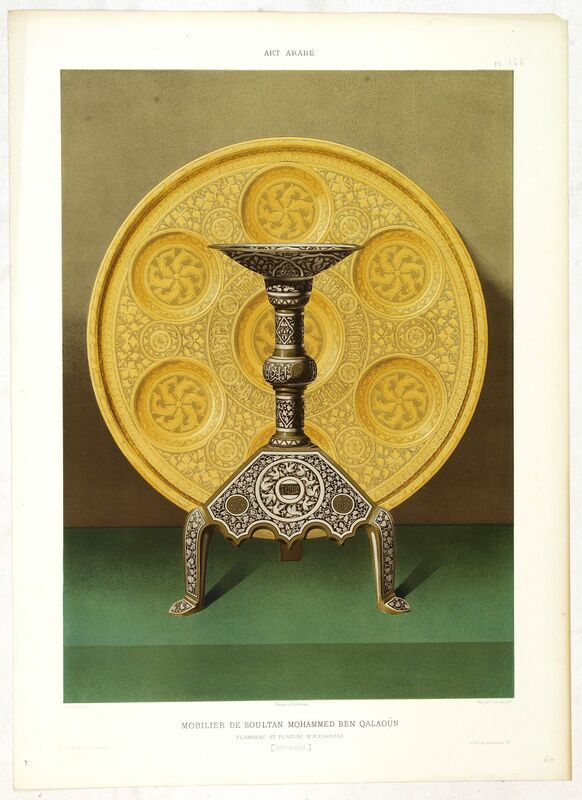 ¤ Rare et remarquable ouvrage sur l'Orient, le plus important du XIXe siècle entièrement consacré à l'art arabe. Illustré de 199 (sur 200) planches. 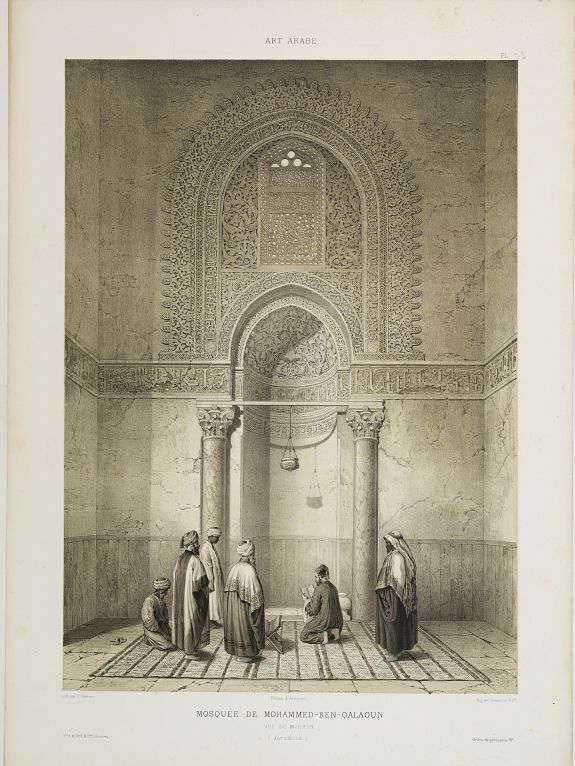 Il contient des vues lithographiées d'après le grand photographe Giraud de Prangey (1804-1892), l'un des premiers voyageurs français à prendre des photographies au Caire et à Jérusalem. Les photographies de Girault de Prangey figurent parmi les plus anciennes que l’on connaisse de l’Orient. Les planches, lithographiées en couleurs ou teintées, représentent des vues de vestiges (extérieur et intérieur) et des détails d'ornementations (portes, heurtoirs, flambeaux, plats), armes, émaux, tapis, manuscrits et Corans. Mention de "deuxième édition" sur les chemises, texte édité à Paris, Ve A. Morel et C.ie, libraires-éditeurs - 13, rue Bonaparte, 13. 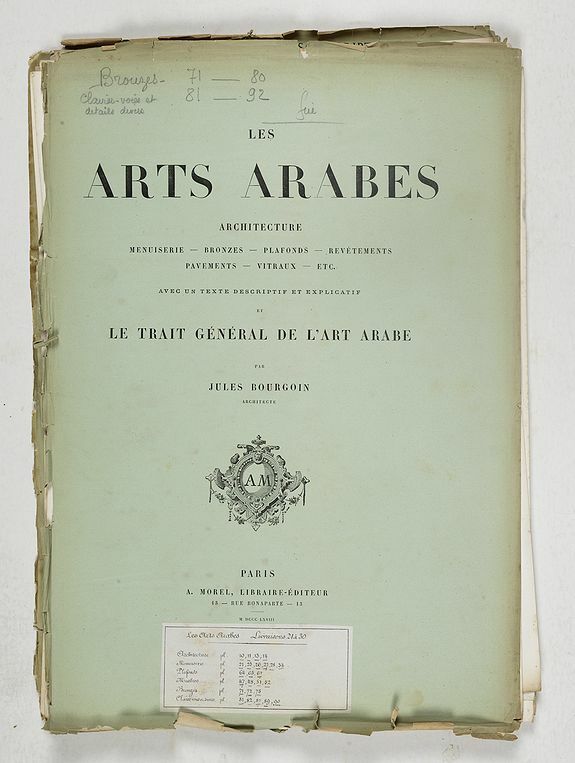 - Prisse d’Avennes was one of the foremost scholars of Arabic art and architecture of the 19th century; this work represents the summation of his studies. From the aspect of chromolithography, this ranks as one of the greatest accomplishments of the medium. 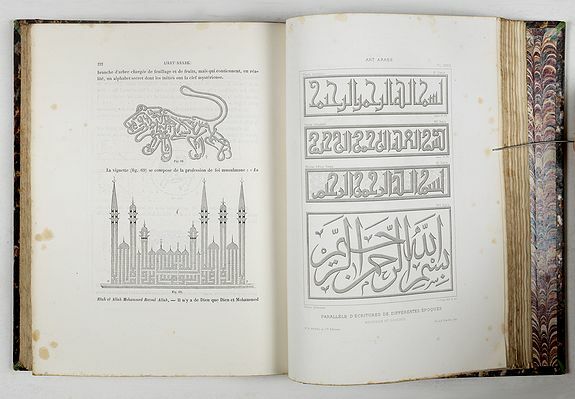 This important work illustrates all aspects of Islamic art, including architecture, woodwork, tiling, interiors, furniture, arms and armour, glass and enamels, carpets, manuscripts and Korans. 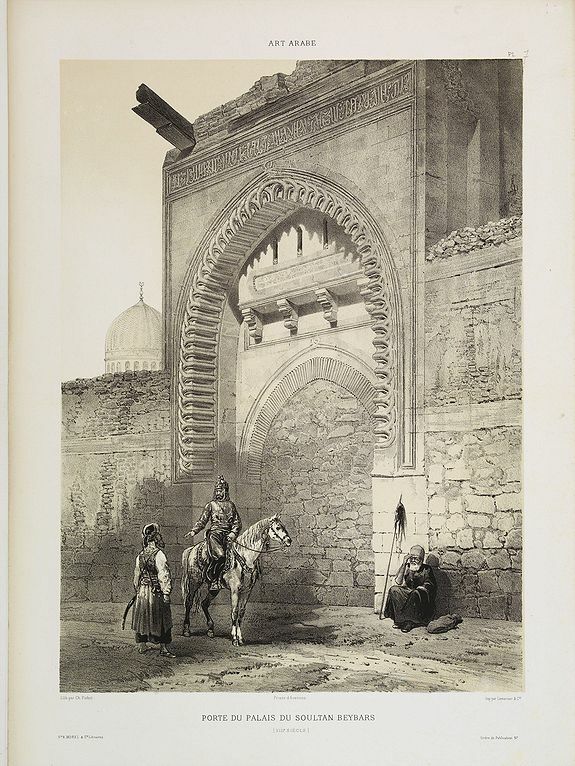 Illustrated with 199 (of 200) plates, some are engraved after the great Photographer Giraud de Prangey (1804-1892), who was one of the first French travellers to take photographs in Cairo and Jerusalem. Mention of second edition on original publisher’s wrappers, text published in Paris, Ve A. Morel et C.ie, libraires-éditeurs - 13, rue Bonaparte, 13. Not in Blackmer or Atabey. 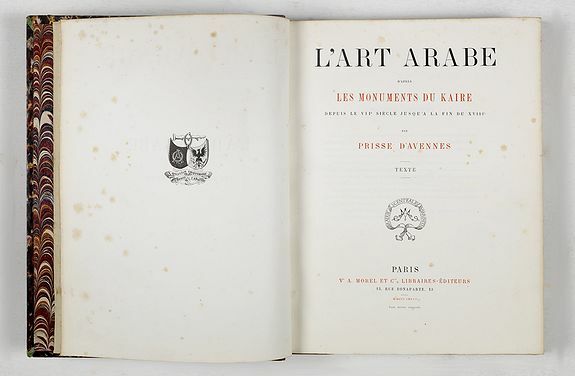 « L’Art arabe d’après les monuments du Kaire depuis le VIIe siècle jusqu’à la fin du XVIIIe by Émile Prisse d’Avennes, was published in four volumes by V.A. Morel in Paris between 1869 and 1877. 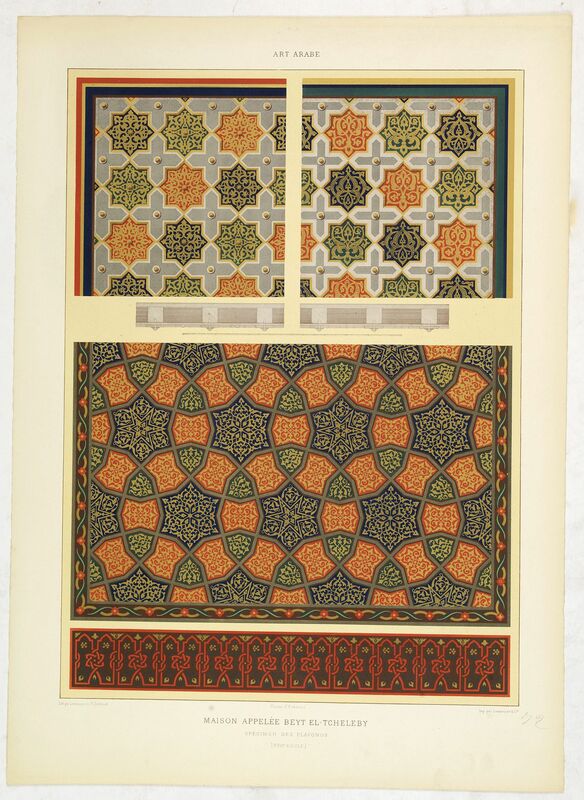 Its 200 chromolithographs, depicting in extraordinary detail a large range of Islamic religious and domestic architecture and decoration, predominantly from Egypt, were a remarkable technical achievement. 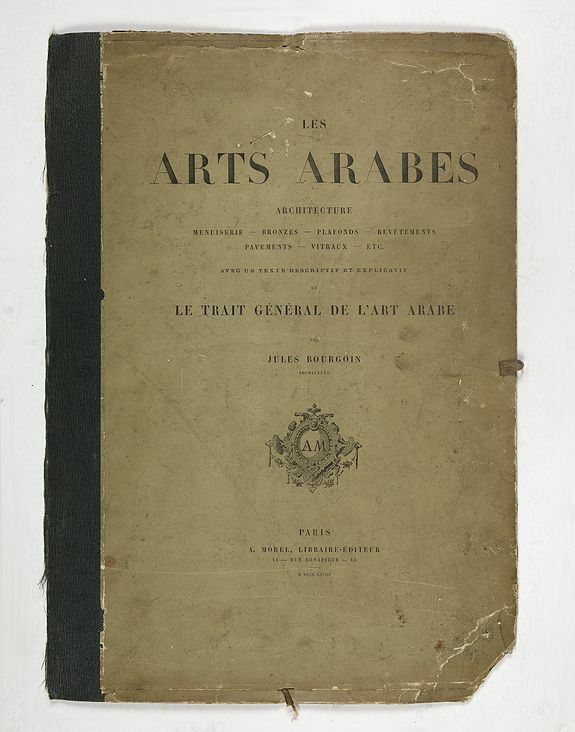 No less impressive were the 300 pages of text comprising a detailed chronicle of the geography, history and monuments of Egypt from the Arab conquest to the French invasion in 1798, as well as descriptions of the individual buildings and artefacts chosen for the plates, carefully classified to show the artistic development of each group. ……. These plates and their explanations were based on Prisse’s extensive and thoroughgoing observations made during his many years of residence in Egypt. Between 1827 and 1844 he worked first for Muhammad Ali as an engineer and teacher, and then independently, exploring the country’s ancient monuments along the Nile as far as Nubia. Dressing and living as a Muslim, and having mastered both classical Arabic and the local dialects, he was well placed to study and understand Egyptian society. At the same time he knew and exchanged scholarly expertise with other long-term foreign residents, but only a few of these equalled his ability so effectively to cross the cultural boundaries between East and West. ….. The plates are the results of Prisse’s collaboration with other artists, a complex process that has not yet been fully disentangled. 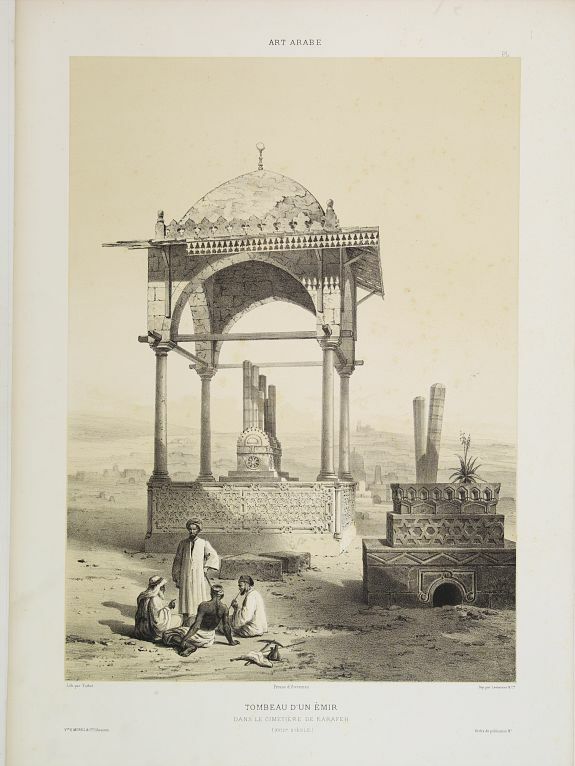 They reflect his considerable skills as a draughtsman, but also his reliance on early photographs of Egyptian monuments. 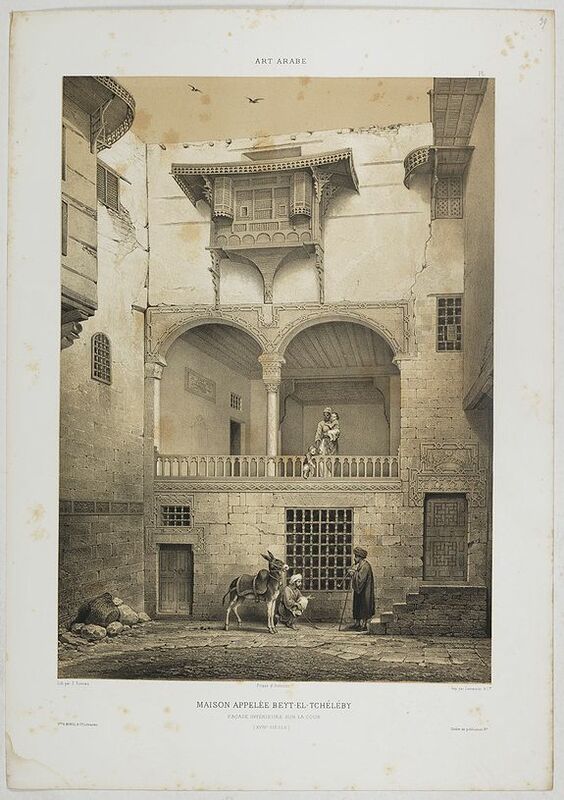 When he returned to Egypt in 1858-60 for a second visit, Prisse brought with him not only the young Dutch artist, Willem de Famars Testas, but also a photographer, Edouard (baptised Anasthase) Jarrot. The work produced by all three men, as well as material from other sources, is contained in the extensive holdings of his papers at the Bibliothèque Nationale de France, and is currently undergoing research.” (Briony Llewellyn and Mercedes Volait). - Manque à Blackmer et à Atabey. 32 CHAUMEAU, Jean, seigneur de Lassay. Histoire de Berry, contenant l'origine, antiquité, gests, prouësses, privilèges et libertés de Berruyers, avec particulière description dudit païs. Lyon, Antoine Gryphe, 1566. Petit in-folio de 4 ff., 365 pp. & 12 ff.n.ch. , veau fauve, plats conservés ornés d'un médaillon doré au centre, filet doré encadrant les plats. (reliure de l'époque). Reliure en partie restaurée, dos et coins refaits. Coupes et plats frottés. 340 x 220 mm. Je voudrais de plus amples renseignements sur le Lot N°61351 . ¤ Unique édition de cet ouvrage, rare lorsqu'il est complet de ses planches. L'illustration entièrement gravée sur bois comprend un superbe encadrement sur le titre portant la devise de Gryphe : Virtute duce, comite fortuna, le tout surmonte d'un griffon aux ailes déployées et les allégories de la Prudence et du Temps sur les bords, les armes de la ville de Bourges presque a pleine page, une planche double hors texte avec La carte de Berry contenant les noms des localités en minuscules italiques, une superbe planche double dépliante hors texte avec une vue cavaliere placée dans un cadre ovale pour le Pourtraict de la ville de Bourges, gravée par Jean Arnoullet. De plus, l'ouvrage est orne de tres nombreuses figures d'armoiries des officiers municipaux, de bandeaux, de lettres ornees et des monnaies de Bourges. Jean Chaumeau : Fils d'un procureur de la ville de Bourges, Jean Chaumeau, seigneur de Lassay (15.- apres 1566) était avocat et archéologue. Il fut élu échevin de sa ville en 1540. Son ouvrage contient un récit légendaire sur l'origine, l'antiquité, les fastes et la noblesse de sa province et de la capitale du Berry, cependant l'ensemble de la partie moderne présente le plus grand intérêt, car elle abonde en détails d'une réelle importance historique et documentaire. Dans sa longue Chronologie, arrêtée en 1562, Chaumeau donne a Bourges 3733 ans d'ancienneté. Ouvrage bien complet de la carte du Berri sur double page et de la grande vue de la ville de Bourges. 33 BOUR, Ch. Vichy ses sources et ses environs. Clermont-Ferrand, Talbot, ca. 1860. 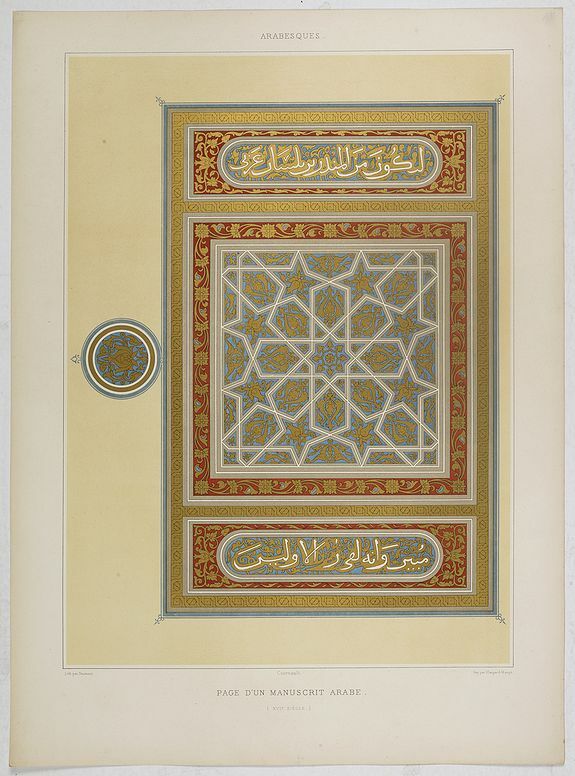 In-folio de 1 p. de titre et 20 pl. 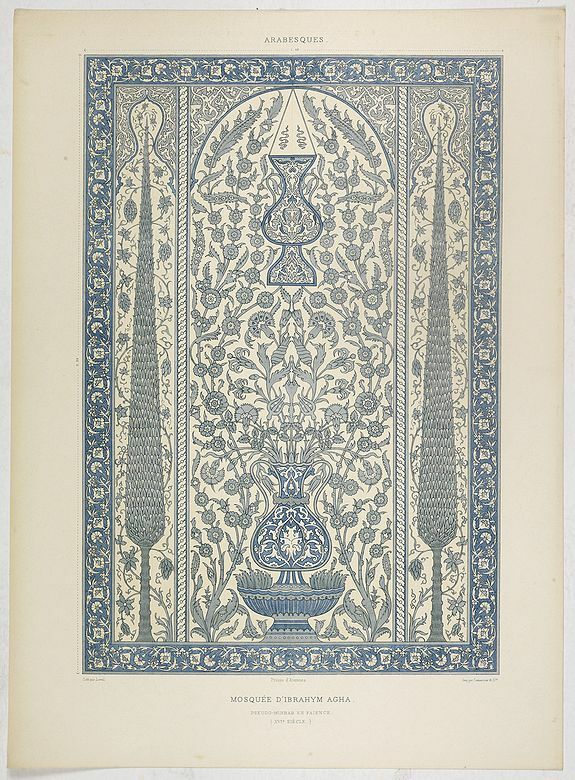 lithographiées brillamment coloriées à l'époque ; pleine percaline bleue, plats estampés à froid, décor doré sur le premier plat avec titre doré. (Cartonnage d'éditeur). Cartonnage légèrement sali, infimes rousseurs affectant les planches. 445 x 310 mm. Je voudrais de plus amples renseignements sur le Lot N°25402 . 34 QUAD / BUSSEMACHER. Europae totius orbis... Cologne, 1592. In attractive strong original colours. Quarto. Title-page and 46 maps without text on verso in gorgeous full original colours. Blind-tooled brown calf in the style of the 16th century (Pastiche binding). Size of binding 250x180mm.) The left half of map (10) of "Misniae et Lusatiae Tabula" is missing. Engraved frontispiece soiled (restored) backed on later strong paper, with some old inscriptions in ink. Paper slightly browning and brown spotting throughout. Some minor restorations in the margins. Fine example in very strong and fresh strictly contemporary colours. 250 x 180 mm. Je voudrais de plus amples renseignements sur le Lot N°39862 . ¤ Early edition of this scarce atlas illustrated with an engraved frontispiece and 46 original hand coloured double-page maps (half of the map "Misniae" is missing) without text on verso. Bound with a manuscript list of the maps in French : "Table des Cartes contenues dans cet Atlas". The maps bearing old handwritten numbers on verso and titles translated into French above each map. The atlas contains maps of all parts of Europe engraved by Johann Bussemacher or Matthias Quad, many with medallion portraits (among Philip II of Spain son of Emperor Charles V). The maps of Austria and Braunschweig dated 1593. The early editions published in 1592-1593 were printed with no fixed number and no precise order of the maps and without text on verso. Meurer only knows 5 copies. Contents : Europe, Germaniae, Bohemia, Helvetia, Austria, Moravia, Prussiae Descriptio, Marca Brandenburgensis, & Pomerania, Saxonum regionis, Misniae et Lusatiae Tabula (only right hand part of th map), Mansfeldiae Comitatus, Francia Orientalis, Sueviae, Salisburgensis, Bavaria Ducatus, Elsatia superior, Alsatia inferior, Braunswick Ducatus, Waldeck comitatus, Habes...Westphaliae, Trier, En tibi... Ducatus Geldriae, Gronigensis..descriptio, Frisiae, Hollandia, Zelandicarum insularum, Brabantiae, Flandria Galliae Belgicae, Namurcum, Lutzenburgensis, Artesia, Angliae regni, Scotiae Tabula, Regni Hispaniae, Portugalliae, Franciae, Burgundiae inferioris, Lotharingiae ducatus, Italia, Sicilia (with portrait of Philip II of Spain son of Emperor Charles V), Graeciae, Hungariae, Poloniae, Ducatus Oswieczensis, Daniae regni, Thietmarsiae Holsatiae. MEURER, Atlantes Colonienses, Nrr. QUA 1-2. 35 ROLLIN / DEBURE Méthode Pour Etudier La Geographie . . . & un Catalogue des Cartes Geographiques, des Relations, Voyages, & Descriptions les plus necessaires pour la Geographie. Paris, 1742. Uncoloured. Printed title, 252pp. Good condition. 170 x 100 mm. Je voudrais de plus amples renseignements sur le Lot N°36482 . ¤ Third edition, Voume I, second part containing "Catalogue des meilleures cartes geographiques", starting with a list of globes by Guillaume de L'Isle and Coronelli. A list of maps for the different countries, followed by lists of maps by Nicolas de Fer, Covens & Mortier, Sanson, De Vaugondy, Beaurains. Complete title : of of "Méthode Pour Etudier La Geographie, Ou L'On Donne Une Description exacte de l'Univers, formée sur les Observations de l'Academie Royale des Sciences : Avec Un Discours Preliminaire Sur d'étude de cette Science, & un Catalogue des Cartes Geographiques, des Relations, Voyages, & Descriptions les plus necessaires pour la Geographie" by L'Bbé Lenglet Dufresnoy. 36 SEUTTER, M. [Atlas de Seutter] Augsburg, ca. 1750. In attractive strong original colours. 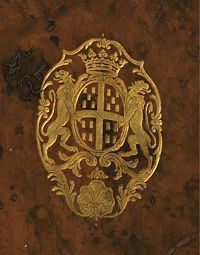 Contemporary calf with arms of Antoine-Clériadus de Choiseul in gilt on upper and lower covers, spine in 8 compartments with raised bands, gilt, title lettered in gilt on red morocco label. Large folio (555 x 370mm. ), engraved allegorical title, manuscript index at beginning, 161 double-page engraved map sheets (including the world and 4 continent maps, 6 of the Americas, 8 of Asia and a detailed town plan of Nuremberg. A Royal example in mint condition, dark printing, attractive strong body colours and thick paper. Exlibris of "Bibliotheque Legentil" on inside front cover. 555 x 370 mm. Je voudrais de plus amples renseignements sur le Lot N°39507 . ¤ A made-to-order atlas based on his "Atlas Novus sive Tabulae Geographicae". Matthaus Seutter the elder first published his "Atlas Geographicus" in 1720 and added to the contents in subsequent editions under the title "Atlas Novus". He was succeeded in his business by his son Georg Mathaus Seutter, and after his death his son Albrecht Carl inherited, but died early in 1762. Matthaus' widow then sold the business to her sons-in-law Tobias Conrad Lotter and Johann Michael Probst, who eventually left it to M.A. Lotter Matthaus' grandson. PROVENANCE : Claude Antoine Clériadus de Choiseul La Baume, was born October 1733 in Nancy and died as a victim of the French Revolution at the guillotine on May 4th 1794 in Paris. Son of Charles-Marie, Marquis de Choiseul-Beaupré and Anne-Marie de Bassompierre. de Choiseul was an aristocrat and general and made campaigns to Germany in 1758 and 1759. Most likely it was here that he obtained a group of maps from the than well know publisher Seutter. Claude Antoine Clériadus de Choiseul entered service on June 5, 1746, as a cornet in the regiment of La Rochefoucauld-cavalry, which he rejoined in Italy. On the 10th of August, 1746, he was in the battle of Tidon, and in the defense of Provence, and from 1747 to 1748, he served on the frontiers of Piedmont region. A two-page map with additional leaf with town plans of Piedmont has been added to the atlas. On February 1, 1749, he was appointed second cornet of the Queen's Light Horse Company, with the rank of lieutenant-colonel of cavalry, then became lieutenant and captain of the bodyguards of King Stanislas II of Poland. In 1757, he made a campaign to Germany, and was appointed November 29 to the company of the gendarmes of Orleans. He was at the Battle of Lutzelberg on October 10, 1758, and at the Battle of Minden on August 1, 1759. On April 19, 1760, he became a second lieutenant in the Scottish gendarmes company, and he fought at Warburg on July 31, 1760, and at Clostercamp on October 15, 1760. On February 20, 1761, he was appointed camp master of a regiment Of dragoons, and became a sergeant of dragoons the same day. On the 15th and 16th of July, 1761, he was at the battle of Filinghausen, and on the 30th of August, 1762, that of Johannesberg. In May 1763 he was promoted marshal of the camp, to take rank on 25 July 1762, and took the post of inspector general of the cavalry the following year. He was promoted to Lieutenant-General on December 5, 1781. His collection of books is noted among his cabinet of curiosities in the literature; "Il avait réuni une bibliothèque importante et un cabinet de curiosités" (Olivier, Hermal et Roton, Manuel de l'amateur de reliures armoriées françaises, planche 813). Arrested, he was sentenced to death and guillotined on 4 May 1794 in Paris. Ex-libris label printed on the inside first cover : "Bibliothèque Legentil" with 2 upper case letters: "M A".